Having a comprehensive pantry list: I spent a couple of weeks compiling a pantry list as I went through my cupboard, fridge and recipes, and put together a list of every single item that I buy for my raw food kitchen. Now it is only a matter of picking up that list, going through my kitchen, and ticking off what I need to buy each week. That way when it comes to making any of my raw food dishes, I know the ingredients are going to be there. Making double or triple batches of recipes: When I make a raw cheesecake, I make two. When I make a batch of humus, I make a big batch and store half in the freezer. When I make a salad for dinner, I make it big enough for lunch the next day… This saves time and energy and means that I always have plenty of pre-prepared food available. Find an organic fruit & veg delivery service: I love having my organic food delivered to my door. I order online, and it’s dropped off a few days later. Having that pantry list on hand also helps me be organised with my orders. 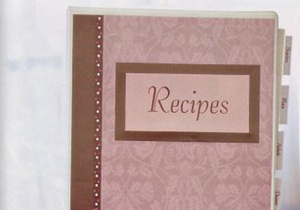 Make up your own recipe folder: I have the recipes I use most often, typed in a folder with plastic sleeves that I refer to all the time. No messing up my recipe books and trying to remember what recipe is in which one! Spend an hour once a week on meal planning: Once you are familiar with a lot of raw food recipes, you may not need to spend much time on it at all, but in the beginning, planning what you are going to eat for the week, and making sure the ingredients are on your pantry list, saves a lot of time and bother. Making sure you have enough “snack” food! This is the one that can make a huge difference between sticking to a food plan, and going off the rails. We usually don’t need anywhere the amount of food that we think we do, but until we’ve built our nutrition levels up and have broken our old habits, then snacking is likely to be a part of our day. So make sure you have “snack food” about, or you may be tempted to go and buy something quick and processed. I have things like humus and dehydrated crackers or carrot & celery sticks handy; tahini balls, nuts & dates and plenty of fruit to eat as needed. Of course it may seem like a bit more work at the start – but being organised and getting into a routine with your food preparation makes a big difference once you’ve been doing it for a little while. I read this post a few days ago and thought about how I could implement these strategies in my life. Having a comprehensive pantry list/planning meals/having enough snacks all kind of went hand in hand so I started with these on Sunday afternoon. Let me tell you…not only was my trip to the store faster and less expensive than ever, but this week I’ve eaten more filling and diverse food than normal. Thanks so much for your positive message, I’m really pleased that these tips were helpful These came purely from my own experience, so I know they can help a lot in getting it together and actually making it easier for yourself. Anything that makes eating well easy is good! Under the comments on the Kitchen Tour (just put that in the search engine on this site) I have put a link to where you can buy the jars.